2014 is about to come to an end. We can’t wait to see what 2015 has in store for us. From all of us at ruled by paws, have a very safe and happy new year! I can’t even count the number of times I’ve had people come up to me and ask if the dogs are no longer on duty at times like this. even though we are obviously still in a public place, where pets are not welcome, people seem to think that because the dogs are lying quietly while we eat or whatever, that they are no longer working and can be loved. I am always willing to talk to people about the dogs and often allow people to talk to them while they’re chilling, but I also try to inform the public about the fact that even though it may not look as though they are actively working, the dogs are still on alert and ready to move when asked, so as long as their working gear is on, they are on duty. On an aside, rogue found it really hard to stay hidden with aiden under the table as well. he’s a big boy, so takes up almost all of the room, but she made a good effort at staying out of the way. Maybe it was having aiden there, but Rogue also did really well at staying down when I asked her to. Aiden, Skye and Bailey have now been with us for almost a week and everyone is getting along quite well. Our bed is a queen-size, but it isn’t quite big enough to fit 6 full grown retrievers, so let’s start with just the 5 labs. Rogue thought it would be cool to pose with her sister, skye. Don’t they look so much alike? Cessna wasn’t so sure she could handle having her picture taken more than once, so here’s a shot of just the fox red labs and Bailey. Aiden and Bailey got tired of posing, so here’s Canyon with Rogue and Skye. At approximately 6:45pm Thursday, a 34 year old woman came across the mutilated body of Ms. Pinky. She immediately ran to the phone and contacted police. When police arrived, they were met at the door by 6 extremely friendly retrievers and their worried human. Upon cursory examination of the scene, investigators immediately ruled Ms. Pinky’s death a homicide. When asked to provide details, the woman stated that she had been putting away laundry when she heard a horrible sound. She said it could only be described as the sound a squeaky animal makes before it dies. She said the noise only lasted a few minutes during which time she was rushing down to the living room from her bedroom on the 2nd floor of the house. When asked what she saw, the woman became tearful and said she walked into the living room and couldn’t find anything disturbed, so moved into the kitchen, only to discover Ms. Pinky’s mutilated body. When asked if she had touched anything, she said she was too afraid to do anything other than run back upstairs and dial 9-1-1. When asked if she noticed anyone near or leaving the scene, she said she thought she heard the sound of paws moving quickly towards the dining room, but she couldn’t identify the unknown subject. next, investigators went into the living room to question the little fox red lab. When asked what she had seen or heard, she climbed under a red sleeping bag and refused to answer. Seeing a black lab moving towards the stairs, investigators gave up on the little lab and followed. The black lab claimed she hadn’t heard or seen anything. She said she had been in the backyard with a golden retriever and another female fox red lab, chasing squirrels. Noticing a white coloured lab lying in the doorway of the bathroom, watching, investigators decided to see what she could tell them. and was dying to share her story. According to her, a big male fox red lab snuck up behind Ms. Pinky and snatched her off the ground. He then proceeded to take her into the kitchen, where the white lab says she saw him lie down and begin stripping off Ms. Pinky’s pink and yellow flesh. Horrified by what she had witnessed, the white lab says she quickly turned away and hid in the closet until she heard police arrive. Feeling as though they had obtained enough evidence to arrest and charge their suspect, investigators searched the house. they found Ms. pinky’s killer sprawled on the bed in the master bedroom snoring loudly. Afraid they might spook their suspect, investigators called for a leash before taking him into custody. Ms. Pinky will be laid to rest in the waste section of the family garbage container on Saturday, April 5th, at 11:00am. The family dogs are accepting donations to be put into the Buy a Dog A Toy Fund. Aiden, our first foster puppy from Autism Dog Services, is here for 11 days!! Aiden arrived Sunday afternoon with his doggie cousins skye and Bailey. Skye is Rogue’s half sister, they have the same sire, she’s just a year older. Skye was once an ADS foster puppy, but wasn’t quite cut out for the job. Bailey wasn’t ever a foster puppy, she’s always been just a loveable pet. Today Aiden is 5 years old! It’s hard to believe five years have already passed. Monkey Man, it’s been a while since we last saw you, but I hope you have an awesome day and continue to make us proud with the work you do for Kam. Today our first foster puppy for Autism dog Services, Aiden, turns four. This is so hard to believe! It feels like just yesterday we handed off his leash to the Carroll family forever. Aiden was such an amazing puppy to raise and train. He had so much life and enthusiasm. I think this is why Huib and I love rogue so much, she reminds us of our big caramel goofball. We get almost daily updates on how our boy is doing, but I really have nothing new to report. He continues to attend school with Kamaran, still loves apples and to play fetch until he can’t walk. We’re hoping to get together with Aiden and his family in the new year, but until then, here are some of my favourite Monkey Man pictures. Happy 4th Birthday Aiden, Amber, Teal, rody, Libby, Taz and Marley! As mentioned in this post, the topic for this round of the Assistance Dog Blog Carnival is “achievement”. I have been racking my brain for weeks, trying to figure out what to write about. I finally came up with the perfect idea. 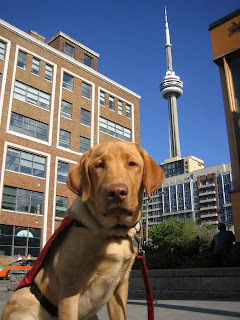 I’ll write about how I achieved the confidence to begin raising and training my future guide dog. On Friday, May 27th, 2005, I was matched with a spunky female black lab named Cessna. From the start, we struggled. She had so much spirit and an endless amount of energy. When she wanted to go, there was really no stopping her. When I wanted to just chill out, she couldn’t figure out what she was supposed to be doing. Cessna’s work was always 100%, but she pulled like a steam roller, and jumped around like a kangaroo when she saw other dogs and small critters. I tried using all of the training methods I had been taught while in class, but our progress was slow and at times seemed to move backwards. To add to our troubles, Cessna had some unknown fears and emotional trauma, which would leave me scratching my head, wondering what I could have possibly done to cause such a reaction. 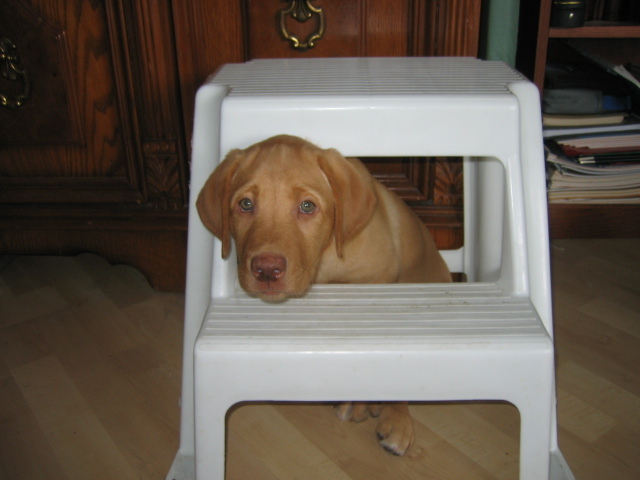 On Saturday, March 1st, 2008, the Director of Autism Dog Services, brought a 10 week old caramel colour lab to our home. With all of the struggles and challenges I had overcome with Cessna, I felt we could use our knowledge to raise a puppy for a young child with autism. Aiden was a big goof. He had an amazing personality and loved to please everyone. We taught him so much within such a short amount of time. People used to stop and watch us in malls, smiling at the four month old puppy, performing his favourite tricks (roll over, give five and show your belly). By the time Aiden was approaching 7 months of age, we started to search for more direction and training ideas for new skills. This is when I began my training sessions with Dogs In The Park. Aiden and I participated in the weekly “stay classes”, while Cessna joined me for “Levels”. Aiden had the most reliable “stays” of all his fellow ADS trainees, and I learned how to teach him complex skills and tricks, such as some of Cessna’s more basic guiding commands. By the time aiden was recalled for formal training, on Friday, February 6th, 2009, he was able to confidently leash guide me, throughout our neighbourhood and within quiet stores to find Huib. It was at this point, when the Director of Autism Dog Services, suggested that I think about raising and training Cessna’s successor. This thought sat in the back of my mind for over a year and a half. On Saturday, February 14th, 2009, Huib and I went to a small kennel in St. Agatha, Ontario, to pick up our second ADS foster puppy, Reece. Cessna and I had been participating in the weekly Levels classes for almost 7 months at this point. Our relationship was flourishing, and I had learned new ways of working with her, that did not include leash corrections or any other forceful methods. We began our raising adventures with Reece, trying to closely follow the new training methods I’d learned through my time with Sue Alexander. We used his lunchtime meals for training and taught him everything using the clicker and praise. Reece wasn’t as quick as Aiden in the learning department, but his trainer was delighted with his weekly progress. With aiden we found it next to impossible to teach him loose leash walking, so with Reece, we worked on leash walking from day one. By the time Reece was six months old, he was able to walk on a loose leash with anyone. Unfortunately, around this time he began to develop a limp which seemed to be coming from his left front elbow. It took the program staff five months to make the decision to wash him out. On Friday, December 18th, 2009, Huib and I picked up a 6 month old male golden retriever from a Mennonite farm in Chesley, Ontario. Canyon (formerly Sparky) had absolutely no name recognition or manners. He mouthed, jumped up on everything, relieved indoors and would pace when he was nervous. We spent the first week teaching him his name and what the clicker meant. We then moved on to teaching him to sit through “capturing”. We knew he loved going outside, so would wait for him to sit before clicking and opening the door as his reward. Once he was sitting reliably, we named the behaviour and started to use it at other times, like before meals and when he’d go to jump up onto something or someone. Through using solely the clicker and treats/praise, we found our relationship with Canyon grew quickly, and his fears subsided easily. Over the next year and a bit, I taught Canyon all of his basic obedience commands without the use of anything other than the clicker and treats. I also continued to work on training with Cessna, teaching her to do various tasks at a distance and expanding her use of the “touch” cue. During the winter of 2010 and 2011, I began working with a trainer to learn more skills and to try and expand my training knowledge. Through these lessons, I learned how to teach Canyon to turn right and left with a simple gesture, and how to better teach him to walk on a loose leash. Training an older dog, compared to a young puppy, can be a bit more of a challenge. The Border Collie Lady taught me how to do things differently in order to move past some of the obstacles we’d encountered. This past summer, I had the opportunity to see what Canyon had truly learned through our lessons with the Border Collie Lady. He walked calmly and confidently at my side through the St. Jacob’s Market while Cessna guided us around people and vendor tables. It was such an awesome feeling to be able to smoothly walk through the market with two dogs at my side. He even surprised me at one point when he showed a desire to try some fire escape-like stairs that Huib was showing Rogue and my friend Karen was coaxing her 13 month old foster puppy up. I handed the leash over to Huib and Canyon walked up and down the stairs as if he’d done them a million times. In February of this year, I learned that Cessna had begun to develop cataracts in both eyes. It was at this point, when I decided to seriously look into raising and training her successor. I researched breeds, looking at the golden retriever, flat-coated retriever and Labrador retriever. After deciding on the lab, I started researching breeders in Ontario. 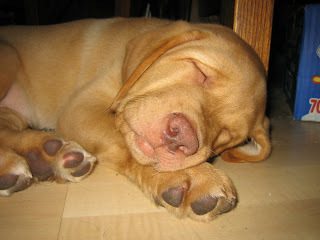 I e-mailed close to 10 different ones, before settling on Red Labrador Retrievers, a small kennel in Maidstone, Ontario. We picked up our 11.8lbs, female butterscotch colour lab on Friday, June 10th, 2011. I’m honestly not sure I would have made such a decision if I had not been matched with my little black firecracker. Through my struggles with her, and experiences with Aiden, Reece and Canyon, I’ve learned tons and developed self-confidence. I’m hoping Cessna will never stop challenging me to become a better person, and that she will help me teach Rogue how to walk in her shoes. September is National Guide Dog Month. I’m about five days behind, but since it seems to be mainly celebrated in the U.S., I thought my tardiness was acceptable. Since this blog has been a little lacking in interesting and factual information, I thought I’d post some service dog related entries for the next25 days. Here’s a picture of Aiden that was taken in Toronto in June of 2008. Therefore, I think I will start my National Guide Dog Month entries, with a post on autism service dogs. Autism service dogs perform a wide variety of tasks, such as help curb unwanted behaviours, encourage interaction with others, and provide independence. Unlike traditional service programs though, such as the ones which train guide dogs, there is a little less consistency surrounding the training of these special canines. • Provide a bridge for social interactions. Even though there are many benefits to having an autism service dog, it is important to look at how a dog’s presence might change the family dynamics. Not every child will find a dog comforting. And not every family will find a service dog helpful. Some families will start the process of attaining a service dog, only to find out that the added responsibilities and public pressures are too much. They may also find that their child is disinterested in the dog and that the dog’s desire to be nearby is too overwhelming. In this article from February of 2003, you will read about two boys (Scotty and Riley), who are learning about how different life can be with their autism service dogs. In this second article, you will read about Aiden’s sister Amber, and the process Katie’s family went through to find out whether a dog was right for her. Here’s a picture of Amber with her brother Aiden, that was taken in October of 2008 at the St. Jacob’s Market. 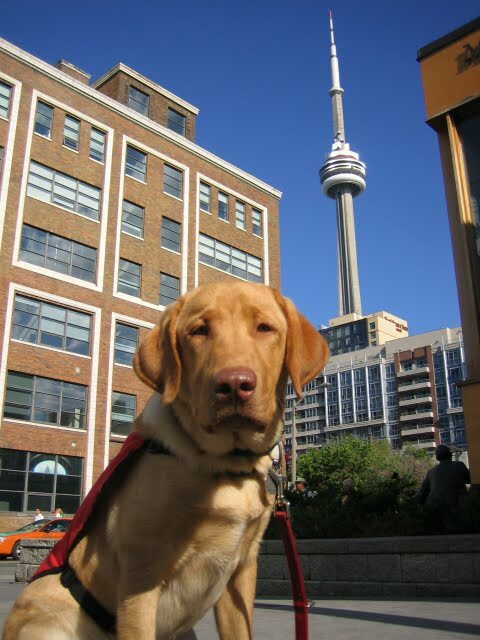 Currently, there are only four programs in Canada which provide autism service dogs. 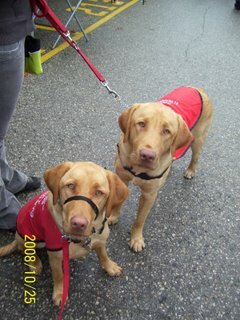 • The Lions Foundation of Canada Dog Guides. With the seemingly endless requests for these special canines, I’m very certain that we will soon see more programs offering autism service dogs, and that it may become just as common to see one as it is to see guide dogs who assist the blind and visually impaired. Come back tomorrow to learn more about our special canine helpers.